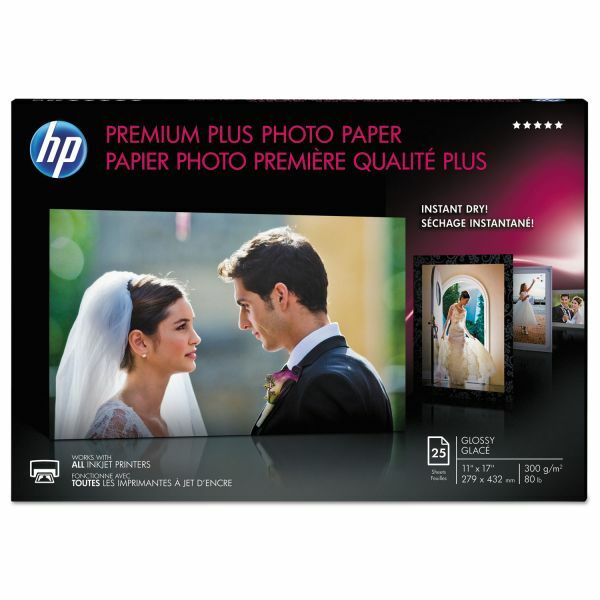 Ideal for consumers who want to print long-lasting, high-quality photos at home. Increased thickness and premium finish deliver the look and feel of a traditionally processed photo. Instant-dry photos are water- and smudge-resistant so you can share them right off the printer. 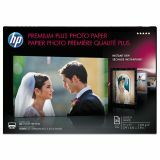 HP Premium Plus Photo Paper, 11.5 mil, 11 x 17, Glossy White, 25/PK - Premium Plus Photo Paper delivers professional-quality photos with Hewlett-Packard Vivera inks that resist fading for generations. Smooth gloss finish, sturdy thickness and weight rival professional photographs. Professional-quality sheets maximize color intensity. Unique HP back-coating prevents prints from sticking when stacked. Ideal for family and important event photos. 17.50" x 11.50" x 0.75"